FREE LIFETIME WARRANTY ON THIS IMMACULATE, 2011 FORD F150 SUPERCREW LARIAT 4X4 THAT COMES WITH A LIFETIME ENGINE, TRANSMISSION, TRANSFER CASE, AND BOTH FRONT AND REAR DIFFS WARRANTY AT ZERO COST TO YOU!! Take a close look at this clean 2011 Ford F150 Supercrew Lariat that just arrived here at Boyles Auto Sales. Alabama Titled it's whole life showing on Car Fax,this F150 that has been Serviced from front to back so you can buy with compete and total confidence. Inside this Lariat you can find, Keyless Entry, Leather Heated and Cooled Seating, Power Seats, Navagation, Back Up Camera, Built in Trailor Breaks, and Sun Roof. Outside this Lariat you can find, Factory Running Boards, Bed Rug Bed Liner, Factory Tow Package, Fog Lights, Key Pad on the Door, and much much more. Powered by the 5.0L V8 , so you can expect class leading power, and It drives and handles perfect! Make the short drive to Boyles Auto Sales and see this Lariat Super Crew for yourself, You'll be impressed! We offer bank and credit union financing with Super Low Rates, so you can drive this F150 Supercrew home today. 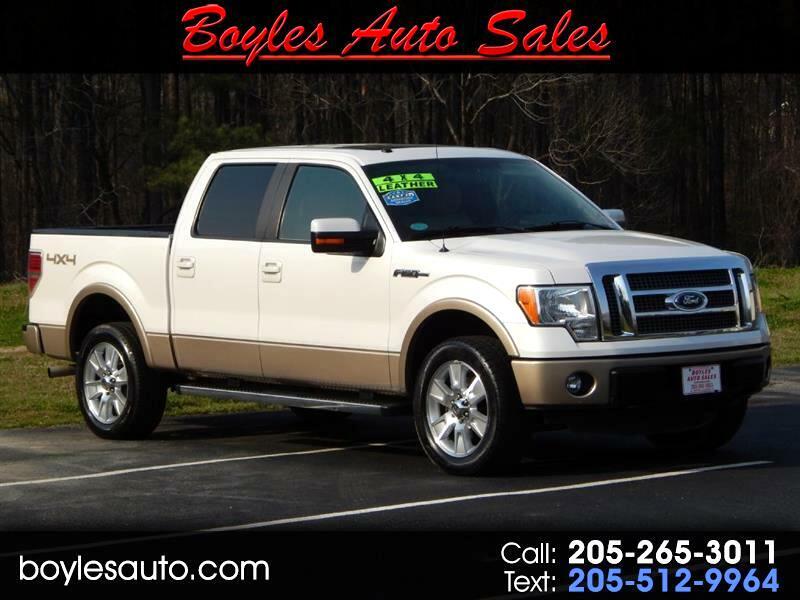 Also, for that added peace of mind that you will only find right here at Boyles Auto Sales remember this: THIS SHARP 2011 FORD F150 LARIAT SUPERCREW 4X4 COMES WITH A LIFETIME ENGINE AND TRANSMISSION WARRANTY AT NO COST TO YOU. NOT A 30 OR 90 DAY WARRANTY BUT A LIFETIME. Call Scott and Tucker at 205 265 3011, Randy at 205 269 3196. Visit our website at boylesauto.com to see more trucks. Thanks. Visit Boyles Auto Sales online at www.boylesautosalesal.com to see more pictures of this vehicle or call us at 205-265-3011 today to schedule your test drive.